Putting the right plant in the right place is critical for gardening success. In particular, some plants prefer sun, while others grow best in shady conditions. However, it is not always obvious whether a specific location in the yard is sun or shade. Shade is a lack of light, but that can occur at varying levels depending on the structure or plant providing the shade. Shade also changes by the time of day, based on the movement of the sun across our sky. Recently, I tracked sun patterns in several locations of my yard every two hours to help me better understand which plants to place where. The ideal time of year to do this is on the summer solstice (June 21 in 2018) since the sun is at its highest on that day. I then categorized the locations by levels of shade and sun, as follows. Areas of light shade receive three to four hours of shade each day, so it is a fairly bright location. The shade moves with the sun throughout the day. It might be created by thin canopies on very tall trees or by structures, such as under a pergola. Plants that need part sun and part shade would work best here. Medium shade provides four to six hours of shade a day, usually in the early morning or late afternoon when sun angles are at their lowest. We sometimes call this dappled shade because patches of light seem to peak through in patches. You can also grow plants that need part sun and part shade here, though shade plants do better. Full shade sites receive no direct sunlight but do get a fair amount of indirect light. Full shade is often found on the north side of buildings, under the building overhang, or under fully leafed out trees. These are locations where it is difficult to grow grass lawns because grass needs at least 4-6 hours of direct sun a day to thrive. You will need shade plants in these locations. Heavy or dense shade is the most intense. These areas receive no direct sun at all. They could be under a porch or deck, under an evergreen, or under a dense tree. These areas will not grow grass and are often very dry because the shade-producing structure or plant blocks moisture from reaching soil beneath them. There are shade plants that will grow in deep shade, but it is the most challenging shade situation. Unfortunately, most plant labels do not classify plants as doing best in light, medium, or full shade. Often they use the term partial shade when referring to the plant's optimum growing environment. Although this is very vague, partial shade is most likely a range between light and medium shade. Remember that shaded locations will change with the seasons and over time as the plants grow and the landscapes evolve. Here is how I classified my garden locations. 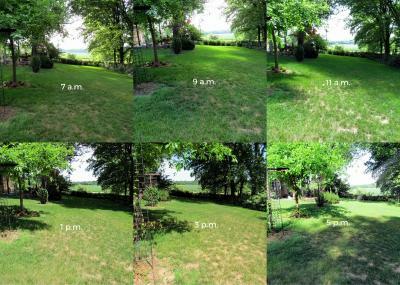 The picture above shows the backyard at 6 different times.